Malabar Spinach or Basella alba is one of the most common vegetables that is grown in kitchen gardens, especially in the coastal and Malanad regions of Karnataka. Called as "Basale Soppu" in Kannada, this is one of my favourite vegetables and makes me nostalgic as the very mention of this vine reminds me of my native place where it grew abundantly. As a child, I loved squeezing its soft seeds which would ooze red liquid. This semi-succulent, mucilaginous leafy vegetable is used in regular curries, raitas, pachadis and even bhujiyas (using leaf).It is also added in non-veg curries like shrimp / prawn (dry shrimps are also used) and clam curries to make it more flavourful. Two varieties are available, one with green leaves and green stem and the other with red / purple stem, green leaves and pink veins. The scientific name of the red variety is Basella rubra. The health benefits of this vegetable are numerous. * Low in calories and fats, it is full of vital nutrients and minerals. So if you are trying to lose weight, consume this vegetable in multifarious ways. * The thick, fleshy, mucilaginous leaves and the stem are full of fibre and roughage and hence facilitate smooth digestion and proper bowel movement. Thus this vegetable is most suitable for those suffering from constipation and indigestion. * It is also an excellent source of calcium and iron. Hence it's highly recommended during pregnancy and especially in the second trimester. Not just that, it It also contains good amounts of many B-complex vitamins such as folate, vitamin-B6 (pyridoxine), and riboflavin. Folic acid is deemed essential to prevent neural-tube defects in the baby and pregnant women as well as women trying to get pregnant are advised to up their intake of folic acid. So consumption of basella during the first trimester of your pregnancy is also good. * Some women also suffer from constipation during pregnancy. This spinach is a godsend to them as it will help not only help with their bowel movements but also provide the required quota of nutrients and minerals. * Folk medicine practitioners also say that consumption of basella during pregnancy helps to prevent miscarriage or spontaneous abortion. * After delivery, regular consumption of this vegetable will also aid in abundant breast milk production and hence a wonder food for lactating mothers as well. As mentioned earlier basella being a good source of calcium and iron, it's regular inclusion in the diet helps with bone health, strengthens teeth and reduces the risk of osteoporosis (Also read Strengthen Bones By Gardening) and iron-deficiency related anemia. *Basella leaves are good sources of minerals like potassium, manganese calcium, magnesium, and copper. Potassium is a key mineral that the body relies on heavily to function properly. It helps to lower blood pressure by balancing out the negative effects of salt. (Sources: 1, 2) Hence consumption of this spinach is highly beneficial to people suffering from hypertension / high blood pressure . Its frequent consumption might also reduce the risk of cardiovascular diseases. Basella is a good source of vitamin C; in fact it has more vitamin C than regular spinach / English spinach. 100 g of fresh greens contains 102 mg or 102% of daily recommended levels of vitamin C. Vitamin-C is a powerful antioxidant, which boosts immunity and scavenges harmful oxygen-free radicals. Fresh leaves are a source of several several vital carotenoid pigment anti-oxidants which play in important role in delaying ageing and warding off diseases. 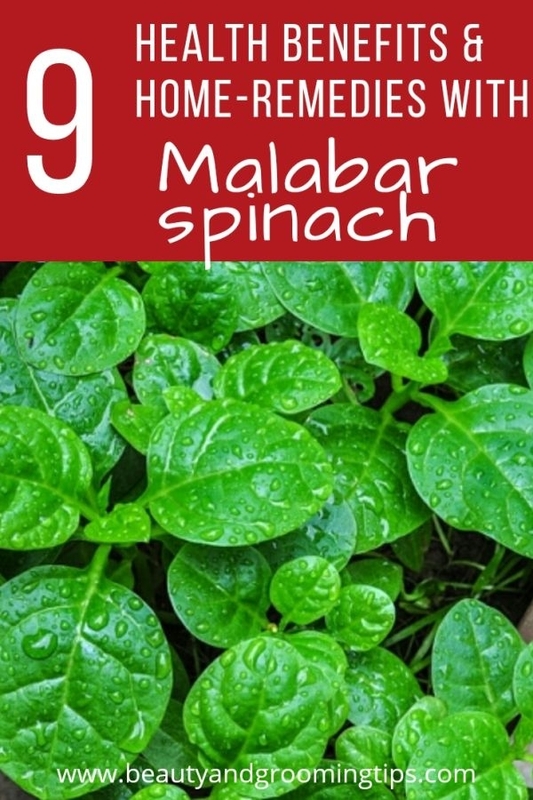 Malabar spinach is a very good source of vitamin A. 100 g fresh leaves provide 8000 IU or 267% of recommended daily allowance (RDA) of this vitamin. . Hence very useful in preventing night blindness and other eye related diseases. * Application of the juice of leaves as well as drinking the juice provides relief in pitta related boils, prickly heat, pus-filled boils and blisters. Basically malabar spinach is pitta pacifying as per Ayurveda and cools the body. Hence useful in relieving skin blisters due to 'heat related' problems. 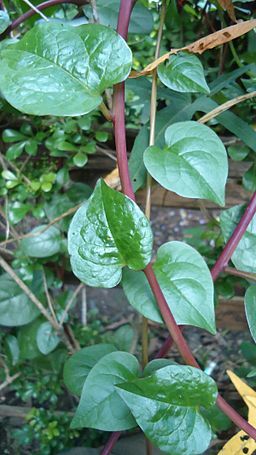 * Chewing the leaves of malabar spinach helps in healing mouth ulcers. Also make it a point to prepare malabar spinach curries and have it when you have mouth ulcers or stomatitis. Preparation of this curry is very easy. Just steam shredded spinach leaves (1-1½ cup) along with shredded onion (1) and a little Tur dal. Grind 1 cup of coconut scrapings, tamarind, 1tsp coriander seeds and 3-4 red chillies. Add the ground masala to steamed stuff. Boil it and do a seasoning (tadka) of ghee and few garlic pods or alternatively a seasoning of mustard seeds, asofoetida / hing and curry leaves. 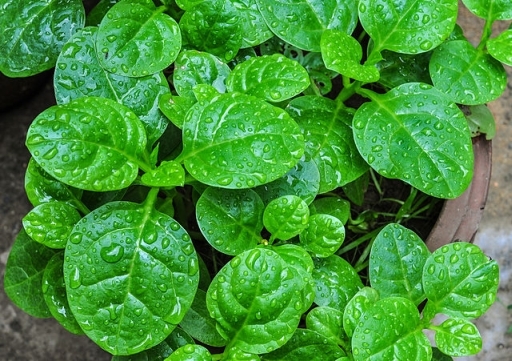 Consumption of malabar spinach raita / salad, drinking its juice or leaf juice application on palms and soles provides relief in case of burning sensation in palms and soles and in burning eyes as well. If one is experiencing burning sensation while passing urine or suffering from urinary tract infection, consumption of this spinach (preferably as salad or in raw form ) helps to get rid of the problem at the earliest.